Coilhouse » Blog Archive » Aum Shinrikyo Anime Funtime! Via DJ Dead Billy, who says “if only L RON would’ve delved into anime!” Think of the possibilities. That cute and cuddly bearded fellow you’re watching in the above clip is none other Shoko Asahara, founder of Aum Shinrikyo (Supreme Truth), the infamous Japanese Buddhist/Christian cult obsessed with psychedelics, yoga and apocalypse. They’re now known as Aleph. Guess they felt like they had to change their name after receiving a smidge of bad press back in 1995, when a group of their members released sarin nerve gas into Tokyo’s subway system, killing twelve people and sending thousands more to the hospital. Yeesh! 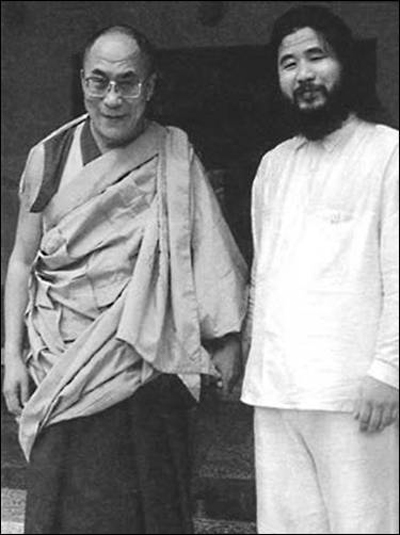 Asahara with the Dalai Lama, sometime in the late 80s. This was a while before Aum Shinrikyo’s terrorist activities, kidnappings and murders started, mind you. The DL’s inner circle members was initially supportive of the cult’s bid for legal religious organization status, but later severed all ties. More recently, Asahara has been a vocal critic of the Dalai Lama and Tibetan Buddhism. It’s worth noting that Aum’s previous deployment of sarin gas on the central city of Matsumoto was officially the world’s first use of chemical weapons in a terrorist attack against civilians. Asahara was convicted of masterminding both attacks in addition to committing several other crimes, and sentenced to death. He’s now awaiting execution. Those crazy Japanese kids. They’ll animate ANYTHING! Is it bad that this still isn’t the most disturbing anime thing I’ve seen? That video is strangely addictive. I must have watched it 15 times in the last hour. How does one join this ‘Aleph’?